JUS '11 grad Karin Finkelstein (C) and Religious Studies major, Michelle Harris (R). Stay up-to-date with important dates, deadlines and events at The University of Arizona by clicking the link above. The Judaic Studies Major requires 31 units, including 16 units of coursework in residency and 21 upper division units. No course used for the JUS Major may be used for any other major or minor. No JUS course used to fulfill a Tier Two requirement can be used for the JUS Major. The Judaic Studies minor requires 18 units, including 9 upper division units. No course used for the JUS minor may be used for any other major or minor. Up to two courses (6 credits) used to fulfill Tier Two requirements can be used for the JUS minor. Select your minor in consultation with your major advisor. In addition, you may consult the Judaic Studies Undergraduate Advisor. Knowing how and when to register for courses, as well as knowing about your registration eligibility can become overwhelming. To making course enrollment easier, we have provided a link to help guide you through the registration process. Internship, Practicum, and Independent Study courses are available with approval from an undergraduate advisor. Students should contact their academic advisor with a proposal. The Arizona Center for Judaic Studies is fortunate to be able to work with The University of Arizona Honors College in order to contract select JUS courses for honors credit. For more information on contracting specific JUS courses, please see your course instructor. For general information on the UA Honors College, please click the above link. The Judaic Studies undergraduate advisor is Professor David Graizbord. Professor Graizbord would be happy to advise you on the Judaic Studies major/minor, to assist you in planning your course schedule or to just give you information regarding the Judaic Studies program. For general advising, contact The College of Social and Behavioral Sciences Advising Center. Strategic Alternative Learning Techniques (SALT) Center is nationally recognized and locally grounded in the best practices for students with learning and attention challenges. The SALT Center's team is made up of experienced and eager professionals who are ready to assist you as you begin your journey of achievement at The University of Arizona. The "Arizona in Israel" study abroad program offered by The Arizona Center for Judaic Studies is a "hands-on" introduction to a dynamic modern society deeply rooted in an ancient culture, situated in one of the world's most important historical crossroads. The Arizona Center for Judaic Studies offers several scholarship opportunities. Applicants must be full time Judaic Studies students at The University of Arizona, in good academic standing. In addition to department scholarships, there are also scholarship opportunities made available through The College of Social & Behavioral Sciences. Looking to get involved on campus? 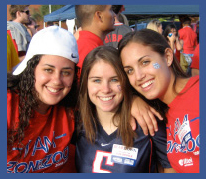 The Hillel Foundation facilitates the development of a vibrant, diverse, meaningful, and empowered Jewish community at The University of Arizona. They are conveniently located on the corner of Mountain and 2nd, across from the Student Union Memorial Center in the middle of campus.